Lenin’s “New Economic Policy (NEP)” relatively soon after socialism began in the Soviet Union. Former socialist countries followed this same pattern in 1989. The degree to which they allowed autonomy at the enterprise level varied, permitting some decisions to be based partly on costs, prices and earnings. Recent research suggests that these reforms come in cycles. They intend to solve critical shortterm economic problems, but in the long run they do not address the root of the problem. These deeper obstacles were related to the basic premises of the socialist system itself. 2 They attempted to correct the “Stalinist” version of socialism derived from the experiences of the former Soviet Union since 1917, later extended to Eastern European countries after the Second World War. The realistic alternative is to change the system. The economic breakdown associated with “bankruptcy” has opened the way for political transformations of the system. 3 Cuba, however, is an exception to thislast generalization. Some have argued that the Cuban regime, resilient to the changes needed, may become a “socialist museum.” 4 This thought is widespread among many Cuban intellectuals who are attempting to search for answers to the situation within the island. This conceptual paper will discuss the present situation in Cuba and different alternatives that may help to extend economic changes to the political sphere. It will describe the objectives and transitions in the Soviet Union and Eastern Europe in an effort to derive lessons that might be helpful in analyzing the Cuban situation. Furthermore, it will examine the extent to which “capitalist” thinking has been introduced into the Cuban political, legal and social structures regarding decentralization, local government and citizen participation. Finally, it will suggest major ways in which the Cuban experience differs from that of other countries, particularly those in Latin America. In addition, this paper will suggest measures that are needed to bring Cuban decentralization, local government and participation efforts in line with other countries, particularly Latin American and the Caribbean nations, that are in the mainstream of modernization of the state and strengthening of municipal governments. Decentralization, local government and participation changes draw their strength from simultaneous contextual changes. From the economic side, macroeconomic reforms such as structural adjustment and stabilization policies are only one dimension. In addition, there is a need to expand foreign trade and investment geared toward the participation of the economy in the “globalization process”; expand the private sector, encompassing the self-employed as well as small and medium businesses and transnational corporations; strengthen financial institutions and labor markets; and develop more efficient marketing and distribution systems of goods and services, public as well as private. Only when implementation of these measures is well advanced and documented with results, is it possible to see significant developments in democratization, decentralization, local government and social participation. Opening at the central level is needed to enact reforms. Zealous civil servants have to relinquish their positions; new competencies and financial functions at all levels have to emerge; and links with intermediary levels have to be built. To isolate only one of these elements and fail to take action with respect to the others would be a futile attempt at reforming the system. … reform has set up or reinforced the powers and autonomy of local government authorities at the lowest level as the most authentic expressions of local selfgovernment … and has favored the grass-roots level … reflecting a desire to bring the government closer to the governed (“Decentralization” 1995, p. 9). There is no doubt that Cuba has already entered into an economic cycle with state modernization reforms which point toward the market system. This is a trend similar to that of other former socialist countries before 1989. Measures implemented by the Cuban government, however, are limited to specific areas and show contradictory trends and attitudes on the part of those that proclaim them. The legalization of the use and holding of foreign exchange (August 1993) has checked speculation in the black market but has stimulated a division between the “haves” and the “have-nots” regarding dollars. The revolutionary leadership is looking at this development with concern. The creation of the Basic Units of Cooperative Production (September 1993) and the authorization of self-employment also have been approved in the midst of concerns about increasing income distribution inequalities. In addition, the military budget and personnel have been reduced (March 1994) and a Tax Law (August 1994) coupled with a law seeking to curb fiscal evasion (July 1994) have been approved. Unemployment and the informal sector of the economy have shown considerable growth and are expected to increase even more in the future. Subsidies have been cut and prices increased to try to reach macroeconomic balance. Paying lip service to “the excesses of capitalism,” a law against “illicit enrichment” was also approved (May 1994). Taxes are being used to curtail earnings. Fees payable to the state by self-employed workers have been raised to moderate authorized self-employment. A modest reorganization of state agencies has been launched. The Central Planning Board (JUCEPLAN) has been merged with other organisms such as the one that used to coordinate external assistance from socialist countries (State Committee for Economic Cooperation, CECE). All experts on the subject agree that these measures have had an impact on the availability and reliability of statistics, which are notably contradictory and absent. This lack of information must be deliberate. It reinforces the “secrecy” that surrounds these regimes and underlines the accountability limits of the recent opening. A Ministry of Tourism has been created. Joint ventures with transnational corporations are common. Incentives for managers and intensive training are being applied with better results than expected. No doubt some progress has been made. A new managerial style has been instituted and foreign investors from several countries are investing in Cuba (PérezLópez 1995). But will that be enough to overcome the secular stagnation of socialist regimes? Werlau estimates, according to the highest official figures, that “in five years Cuba has satisfied 12 percent of the estimated loss of one year of subsidies and assistance from the former Soviet Union, if we rounded to US$6 billion annually” (Werlau 1996, p. 46). The Helms-Burton Law has increased risks for prospective investors in Cuba to even higher levels. In addition, no “capacity building” is observed beyond the specific sectors designated for change, such as limited structural adjustment and macroeconomic stabilization; expansion of foreign trade and investment with some “globalization” attempts; and reorganization of the labor market (more as an outlet to unemployment through self-employment than an encouragement of the private sector in a large scale restructuring of the labor force). Other reform measures are completely absent, particularly trends toward the strengthening of civil society and reduction of the state influence in everyday life of ordinary citizens. The basic power structure as defined in the 1976 and 1992 Constitutions remains in place, but specific government dependencies are responsible for economic priorities which are suffering drastic changes. A new cycle of temporary “capitalism” has been introduced. Decentralization has occurred when economic requirements have determined the need to make this concession. The model is economic reform without political change. China, the most authoritarian state in South East Asia during certain periods, and Chile under Pinochet, seem to be the models for accomplishing these objectives. 9 They offer examples of societies that were open to economic changes but, at least for some time or permanently, refused to open their political systems to opposition forces. Cuba is following this development model at present. Concerns about regional imbalances may be traced back to the beginning of the revolution. The first decade witnessed successful attempts to diminish migration from rural areas to the Capital City. 10 The Institute of Physical Planning (Instituto de Planificación Física, IPF), attached during its first stage to the Ministry of Construction, was founded in 1963 and concentrated on the location of new investments (Boisier 1987, pp. 23-24). These policies were relaxed during the second decade and beyond. In addition, the territorial dimension was better integrated into national plans in the midseventies but suffered when these instruments were rejected as unsuitable to address Cuban realities during the “Process of Rectification of Errors and Negative Tendencies” in 1986. This attitude deepened when the “Special Period” was declared after 1989. From this point forward, former Cuban allies increasingly left Cuba at its own. 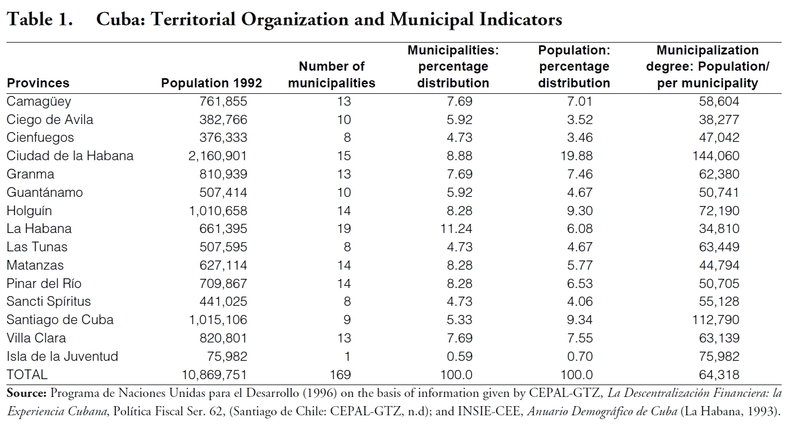 Table 1 depicts Cuba’s territorial and population distribution by provinces and municipalities in 1992. Ciudad de la Habana and Santiago de Cuba provinces have the largest population in absolute numbers, following patterns that were present before the Revolution took place. Nevertheless it is remarkable that the province of Holguín is very close in population to Santiago de Cuba. The number of municipal jurisdictions usually follows unpredictable patterns in many countries. There is a tendency to grant municipality status to territories when constituencies press congressmen to comply with their wishes. The new Cuban distribution of provinces seems to have considered homogeneity criteria to define their limits. The number of municipalities per province vary between 8 and 19, with the exception of Isla de la Juventud. The percentage distributions by province of municipalities and population tend to be fairly close, except in those provinces where the population is heavily concentrated— Ciudad de la Habana and Santiago de Cuba. For the other provinces, there is a certain balance between the two indicators, except in Ciudad de la Habana, where the relationship is inverse. The latter is the only territory, together with Isla de la Juventud, that deviate from the pattern. The crucial test of homogeneity is the number of people per municipality (municipalization degree), which is given in the last column of Table 1. The province of La Habana appears as the province with lowest level of population per municipality, 34,810 inhabitants, well below the average of 64,318 inhabitants per municipality. Nevertheless both figures are manageable. Only municipalities in the provinces of Ciudad de la Habana, Santiago de Cuba, Holguín and Isla de la Juventud exceed the national average. The rest vary between 34,810 in the province of La Habana and 63,449 in Las Tunas. These figures are not very far from each other. This analysis provides a preliminary basis to consider if present provincial jurisdictions have been constructed considering rational criteria. On the basis of homogeneity criteria, which is only one dimension, the territorial division seems reasonable. The consequences of this principle are readily seen at the local level, where administrative organs of “Poder Popular” (People’s Power) are responsible for a myriad small businesses: pharmacies, candy shops, bakeries, dry cleaning shops, restaurants, cafeterias, movie theaters, etc., are under the Principle of Double Subordination. This is a heritage of measures taken during the “Revolutionary Offensive” at the end of the sixties; radical changes at that time resulted in government control of 100 percent of industrial and commercial activities. The Principle of Double Subordination is applied to these operations units through administrative directorates. Consequently, these directorates depend on state provincial and central organizations such as ministries, committees, assemblies and institutes. These entities are in charge of elaborating policies to make operations uniform at the local and provincial level. Tourism, for example, is managed at the central level because it is a national priority. The same happens with sugar production. Local self-government is ruled out in Cuba. The 1992 Constitution is clear about the endorsement of centralism when it states that Cuba has a socialist economy (Article 14) with a comprehensive central plan. 11 It also states that “decisions taken by higher state organs are mandatory on lower ones”(Article 68(d)) and “lower state organs are responsible to higher ones and have to report to them about their management” (Article 68 (e)). An Executive Council composed of the President of the State Council (Fidel Castro himself) and Ministers appointed by him, may decide matters which are the competence of the Ministers’ Cabinet (Article 97). The Cabinet may revoke decisions of subordinated administrative organs accountable to Municipal Assembly (Article 98). The Cuban municipal system resembles the “weak mayor-strong council” model, which means that after elections are held for delegates to the Municipal Assembly, the President of the Municipal Assembly is also the President of the municipality or the Mayor. The Municipal Assembly is equivalent to a large Municipal Council and has faculties to revoke the mandates of the Executive Council managed by the Mayor. This last organ is in charge of managing the production and delivery of basic social services (health, education, social security) or economic operations such as the ones mentioned under the Principle of Double Subordination. Chambas is a rural municipality where the population is dedicated to agricultural activities. Chambas has not changed much in two decades and does not seem that its future would be different from what it is now. The provincial government is taking away many of the functions formerly performed by the municipality of Chambas. The structure and situation of Cuban municipalities as well as their efficiency depend on factors that are beyond their control. On the other hand, decentralization is not a panacea. It is a means for certain goals related to the development model that has been adopted at the central level. This is the way basic needs are satisfied at the local level. On the other hand, many other factors intervene in the chain of command between municipal authorities and the highest authorities which are also beyond what a local government can do. These forces from above tend to take away the few competencies that municipalities exercise. This is particularly relevant in a socialist country where centralism is the adopted system of government. Recently, there have been changes regarding citizen participation: the Electoral Law (1992), the “Consejos Populares,” and the extension of the so-called “Rendimiento de Cuentas” (accountability), which is a mechanism that forces elected representatives to report to their constituency. The Electoral Law intends to open political spaces to people from the grassroots. This is a very important point to clarify because it can put in doubt statements made above regarding the similarity between the Cuban and the Polish municipal systems. After the enactment of this law, there will be two kinds of direct and secret elections in Cuba: to elect deputies to the National Assembly of the “Poder Popular” (each for 5 years) and to elect delegates to Municipal Assemblies (each for 2 years and a half). Before the electoral reform, the provincial and national representatives were elected indirectly by the Municipal Assembly once that body was elected. The principle of both the nomination and the election of representatives by the people is the main argument to defend the new electoral system. This argument runs against the control of who should be elected by the structures of the party. “The multi-party system is a concession— says Fidel Castro when discussing this law— which can never be accepted.” 12 The system attempts to reconcile the existence of one party system with democracy. No doubt that this unique party, as in the Polish case, is the Cuban Communist Party. Any citizen has the choice to vote for one candidate, two candidates, all candidates or none from the Cuban Communist Party. The crucial test is that any candidate should have 50 percent of the electorate plus one vote to be considered elected. Otherwise a second round may take place to make this possible. For making this principle effective, a Candidacy Commission has been created. It is presided by the Confederación de Trabajadores de Cuba (Confederation of Cuban Workers, CTC) and composed by mass organizations such as Federación de Mujeres Cubanas (Federation of Cuban Women, FMC) and Comités de Defensa de la Revolución (Committees for the Defense of the Revolution, CDR ) and others. In the past, this Commission was headed by the Communist Party. An effort has been made to prevent the influence from the only political party existing in the country in distorting the elections, according to Cuban authorities. The Organs of People’s Power consist of five-tier set of assemblies. From lower to higher levels they consist of: neighborhood, electoral districts (circunscripción), municipal, provincial and national levels (Ritter 1985, p. 273). The Candidacy Commission takes the nomination of candidates to the neighborhood jurisdiction. Neighbors approve these candidates by a show of hands. Candidates for the neighborhood are nominated as possible delegates for the electoral districts (circunscripción). Usually only one person is nominated and appointed, although other potential candidates may be taken to this assembly at the neighborhood level, anticipating the possibility of rejections. Experience shows that actual rejection is rare. Ritter (1985, p. 280) states that during the end of the seventies — before the more recent changes took place—“…it is highly unlikely that a candidate with a questionable background, of a noncompliant disposition, or openly hostile, would let his or her name stand as a nominee, thereby risking public embarrassment.” 13 Circumstances have not changed since these statements were made. The process of nomination of candidates now is more structured than in the past. Mass organizations and the Party at the local level are often composed by the same people. Candidates at the municipal level are elected by direct and secret vote of all of the circumscriptions. 14 Thus, the elected circumscription delegates constitute the Municipal Assemblies. These elections take place every two years and a half with the difference that every other election, they also serve as elections for provincial and national office. Electoral commissions have the task of distributing photos and biographies of all candidates at the local level. Electoral campaigns by individual candidates are forbidden. The attitude of the revolutionary elite regarding political campaigns has always been negative. For the revolutionary elite, political campaigns are synonymous with “politicking.” The vices of democracy— particularly those that prevailed before the Revolution— are often brought up in public by the old leaders. According to the revolutionary elite, these shortcomings should be avoided, just as it is important to avoid the proliferation of parties that will divide the Cuban nation. Another measure that tends to enhance representation from below is a rule that stipulates that 50 percent or less of all elected deputies for the provincial and national level, must be drawn from the Municipal Assembly. This rule tends to balance representation, giving grassroots leaders who are young and unknown a better change of being elected to higherlevel bodies. Recently, Raúl Castro (1996), when reporting to the Central Committee of the Cuban Communist Party, summarized the results of these changes. Elections held in February 24, 1993, had a 99.57 percent turnout of eligible voters. For the elections held in January, 1995, turnout was 97.1 percent. The decrease in support was expressed publicly from one point in time to another. While people casting blank or not valid ballots in 1993 was 7.0 percent, this percentage reached 11.3 percent in 1995. No alternatives have been presented to the Cuban people in a way that a decision can be made without pressures and manipulations. External pressures as well as internal social control has prevented authentic expression. The very high voter turnout rates may be explained, in addition to trust on the system, by inertia in the way attitudes are expressed, family or friendship ties, fear, mobilization capacity of the Communist Party and mass organizations, ignorance, survival, double standards of morality, political ambitions, attitudes toward stepping up in the social ladder, “politicking” for a single party, conservative behavior to keep a job in government payrolls, or any combination of all these factors. Participation rates in elections approaching 100 percent of the population who cast their vote, were not rare among the socialist countries— the former Soviet Union and Eastern European countries— just a few years ago. Thus, these figures and their publicity as a success, may be deceptive. Electoral procedures violate the right to secrecy at the neighborhood level. In addition, pressures arising from zealous militants may create an atmosphere of fear and distrust which are difficult to overcome. Some neighborhoods may show a greater consensus. On the other hand there are 50 percent of candidates at the provincial and national level that are considered national personalities or figures, and their popularity only tested within that context. In these cases, the population has no other alternative. There is no way to determine by certified, independent observers that the consensus is valid and reliable as the leadership claims either at the local, provincial or national level. Before the 1993 elections, the only organ of People’s Power that could send forward nominees to the Provincial and National Assemblies, was the Municipal Assembly. Typically, the Municipal Assembly would do this after its delegates were elected. A report by a Cuba analyst (Dilla 1995, p. 77) referring to all elections through the beginning of the 1990s stated that on average, 70 percent of the elected representatives or delegates belong to the Communist Party or the “Unión de Jovenes Comunistas” (Young Communists League, UJC), despite the fact that this group represents only 17 percent of the population. The other institution which is emphasized in terms of promoting more participation, is the “Consejos Populares” (People’s Councils). Although this organization was contemplated in the 1992 Constitution (Article 104) and was experimented before in the Matanzas province in 1974, according to Cuban sources (Asamblea Nacional 1995), conditions are now better for its implementation. These conditions include the elimination of intermediary levels (the regions) and the increase in the number of provinces from 6 to 14. In addition, new responsibilities were placed on the local level during the “Special Period,” such as the collection of taxes and the approval and control of self-employment and economic plans, which require greater collaboration between community organizations and municipal authorities. At present, there are 1,551 “Consejos Populares” in the whole country. The 14,000 Delegates of the Consejos Populares and of the Municipal Assemblies (Councilmen) select a President for this organization among themselves for each “city town, neighborhood, settlement or rural zones” (Article 104 of the 1992 Constitution). They work with mass organizations (CDRs, women organizations, small farmers, workers and representatives of social services and production centers in each jurisdiction). These organizations collaborate with local governments working for greater efficiency in production and services activities and to strengthen popular participation and the quality of life of ordinary citizens. They also exercise fiscal supervision over all entities rooted at the municipal level regardless of their subordination status. An important accountability institution is the “rendimiento de cuentas,” where each elected delegate reports his or her work performance to the electorate twice a year. The delegate reports information and establishes a dialogue with the population. As a result, solutions are found to problems and agreements are reached with the participation of neighbors. According to official figures 31.2, 24.4 and 22.0 percent of the electorate participated in these events in Guantánamo, Las Tunas and Santiago de Cuba between November and December 1995, respectively (Asamblea Popular 1995, p. 4). This institution, however, has been put into effect only since the end of the 1970s. In any event it will reinforce reforms being enacted at the local level as a result of direct elections of provincial national assemblies. Another trend may be detected by analyzing the interplay between the Communist Party and mass organizations vis-a-vis the charismatic leadership of Fidel Castro. One constant characteristic throughout time is Castro’s resilience to be intermediated by institutionalized organizations. During calm times, e.g., the 1970s, he has relied on institutional mechanisms. When difficult times come, then he turns to mass organizations to survive. The swings from left to right and back which have characterized the Cuban Revolution and its leadership exemplify this process. During crises, somehow, some form of “direct democracy” is seen as a viable solution without much intermediation. The Rectification Process and the Special Period are no exceptions. Changes made at the local level reflect more a unique characteristic of the Cuban Revolution and less of a concession to align Cuba with similar accountability and democratic concerns at the international level. Nevertheless, this concession gives territorial responsibilities to the Central Organization of Trade Unions, an organization that has been far away from local structures and has not played a significant role in any stage of Cuba’s political development. 17 This inclusion may be an internal compromise between the Communist Party and the charismatic leadership of Fidel Castro. In any event, the top hierarchy of mass organizations are interchangeable with the top hierarchy of the Communist Party. Often Party leaders shift positions in mass organizations and viceversa. In addition, phenomena such as “sociolismo” (a popular expression mocking the word “socialism” and meaning dubious partnerships) and survival through illegal exchanges in kind, where goods belonging to the state are appropriated if not openly stolen, are so subtle that it is difficult to draw the line between corruption and proper behavior on the part of civil servants. These concerns were raised during the Sixth Congress of the Communist Party in May 1992. Accusations of “improper behavior,” such as participating in the black market, trafficking in foreign exchange and prostitution, were quoted as “contaminating” members of the Union of Young Communists and the Communist Party (Domínguez 1995, p. 30). To apply the law strictly would amount to putting on trial a significant portion of the population, including government authorities. Therefore the “accountability” exercise seems rather ritual when one examines the underlying phenomena where a significant percentage of the Cuban population are involved in illegal activities and many authorities either profit from these illegal exchanges or tolerate them. According to Raúl Castro (1993, p. 5), the revolution defines civil society as mass organizations such as the CDRs and the FMC. In a report presented before the Central Committee of the Cuban Communist Party, Raúl Castro classified NGOs according to whether they contribute or not to the so-called “Track Two.” In this last category fall all social organizations, universities or international donors that, according to the revolutionary elite, harbor intentions to subvert the revolution while hiding behind research activities or wish to strengthen civil society in Cuba. “Track One” corresponds to organizations that are openly opposed to the revolution. Espín, for example, was for a long time the Head of the FMC. This organization deserves study in depth. In other countries there has been attempts to set them up, but in nowhere else has this organization played the paramount role that it played— and still plays— in Cuba. Such an attempt was made in Nicaragua, but the Nicaraguan families in the urban and rural neighborhoods rejected the Sandinistas’ policies. Specifically they resented, and expressed that attitude at the ballot box, the compulsory military service of their children to fight an uncertain war. Electoral results were unfavorable and the Sandinistas had to relinquish power. In this sense, CDRs have been a unique contribution of the Cuban Revolution to the heritage of modern day dictatorships. The CDRs and FMC were created in the sixties, when internal strife was at its maximum and the radicalization of the revolution was taking place. These organizations developed their projection without the existence of a Communist Party. To a great extent, the passionate militancy that accompanied the creation and growth of CDRs and FMC at the neighborhood level was an urban phenomenon. Its basis was the Urban Reform, that together with the radicalization process encouraged the departure of hundred of thousands of Cuban citizens to the United States and other countries. Most of those who departed came from to the Cuban high and middle social classes, and left behind their homes and properties. Their distribution of those properties among those who were using them or those who were loyal to the Revolution, may be called the Cuban “Piñata.” This process is equivalent to what occurred in Nicaragua at the end of the seventies. Behind extreme revolutionary attitudes and militancy rejecting any negotiated solution with exile community may be the fear by the rank and file that these properties could be reclaimed by their original owners, as was the case in Nicaragua. The same may be said of the “Revolutionary Offensive,” which expropriated thousands of small businesses at the end of the sixties. The Cuban Communist Party reached higher status in the seventies when the institutionalization process was accepted and diplomatic relationships with the Soviet Union peaked. The Rectification Process prompted a revival of mass organizations beginning in 1986. Therefore, the new roles assigned to mass organizations during the current “Special Period” have antecedents. On the basis of changes made in 1987, which allowed certain information to be made public, the author took the pains of tracing the links between organizations at the block level and the state security and military apparatus. Recent verification of this information confirms that basically this is the structure that prevails nowadays. The structure is shown in Figure 1. The CDR VOP (Vigilancia y Orden Público— Vigilance and Public Order) Front works directly with the uniformed police. At the end of the 1980s, CDRs were reorganized, with each sector now consisting of several city blocks with one person assigned control. Each morning, the sector controller meets with the CDR officials (the president, vice-president, or other official), particularly those in charge of VOP, at each block and obtain the daily log of activities in that particular block. The structure consists of a president, vice-president, a treasurer, an organizer, an official responsible for the work force, and another for ideological control. CDRs al include an important component, referred to as the CDR Vigilance and Public Order Front (Vigilancia y Orden Público). After the September 1986 CDR Congress, a special component (front) was introduced to assist those young people who neither work nor study. This division of the CDR is referred to as the Prevention and Education Front. This front notifies the police department of all pertinent information regarding young people who are neither in school nor working. CDR characteristics probably vary according to population size, prevalence of common crime or acts against the state, extremism of the CDR authorities, educational level, etc. An important variable is the lack of commitment of the rank and file at the local level. Within each block, there is one other agent who deals indirectly with the CDRs: this person reports directly to an officer of the security apparatus of the Ministry of Interior. Very rarely are the secret duties of this person known to other block citizens or CDR officials. In order for a CDR official to be informed of the duties of this person, there must be a working relationship on a particular case. The organization of the CDRs by sectors and blocks follows the national-regional-province-municipalityzone-sector-block pyramid structure. The sector controller holds a full-time job. They patrol on foot since they do not have other means of transportation. Their work hours might vary from 9:00 a.m. to as late as 11:00 p.m. Most of them do not even live in the sectors they patrol. The president of the CDR provides all pertinent information to the sector controller. Frequently, however, the sector controller does not trust the CDR president and usually verifies this information with VOP Front Officials. If enough evidence of wrongdoing is found regarding a particular citizen, the sector controller meets with that individual. Three warnings are given to each citizen, with the first two given in written form. After one warning, the citizen’s file is classified as category A; after two warnings, as B. The third warning results in the arrest of the citizen and classification of his or her file as category C.
There are national, provincial, municipal, and zone meetings for all CDR presidents, who then pass on the information to their block officials and citizens. The VOP Front consists of people who have shown extreme loyalty to the revolution, and who are willing to go to great means to discover wrongdoing. The background of the Front officials varies from retirees to people who have served in international missions. The ideological control person usually has a college degree. 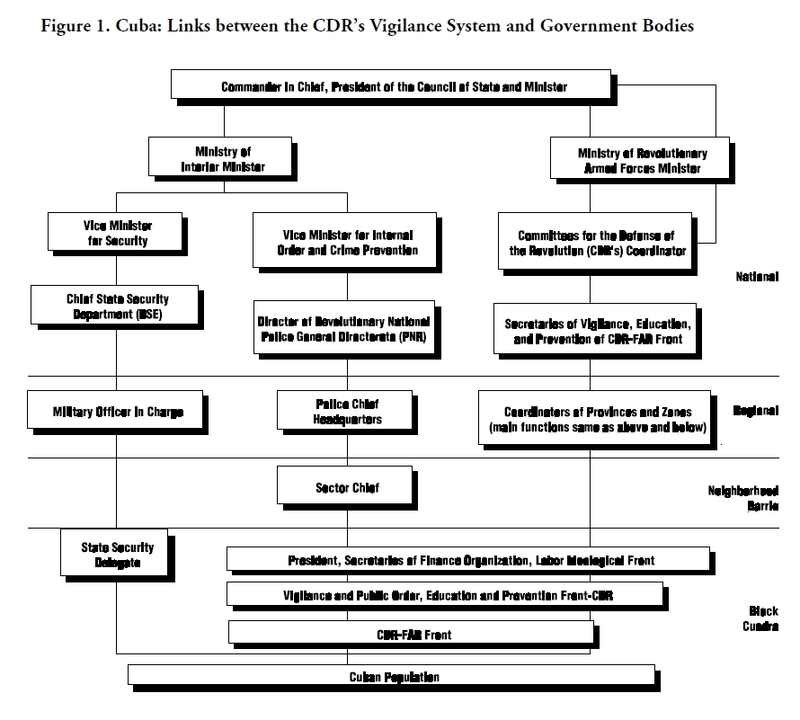 As is depicted in Figure 1, the Ministry of Interior and the CDRs have parallel structures. Security bodies (intelligence and counterintelligence) and police back-stop this mass organization. Designation of officials for different posts within CDRs, especially for being in charge of “vigilance,” are subject to consultation with the MININT officer in charge. This network in turn is linked to the chiefs of “defense zones” and territorial militia, which are the lower layer of the so-called “Republic of Cuba’s Unique System of Exploration” and the mobilization chain for any war action. “Defense zones” are in charge of evacuating the civil population and destroying cities and towns if the socialist system is in danger. These activities are connected to the Ministry of Armed Forces. There are “Voluntary Brigades of Activists” that are mobilized according to instructions of the state security apparatus. The Brigades are sometimes called into action by the police. They are the direct antecedent of the so-called “Brigadas de Respuesta Rápida” (Quick Response Brigades) that hold “repudiation meetings” in front of the homes of undesirable neighbors, sometimes when it is known that they plan to leave the island. The Brigades are a sort of para-military organization backed by the Cuban authorities established for the purpose of harassing and fighting— physically sometimes, with sticks, bricks, and hammers— dissident neighbors and families. The notion of civil society is alien to the policies that the Cuban leadership is pursuing at present. The theories of “transmission belts” and an “enlightened vanguard” suit more closely regime’s goals and modus operandi. The essence of civil society lies in the possibility that social groups could be autonomous, particularly from military and government tutelage and control. This is impossible in today’s Cuban society. The leadership has a horizontal circulation system that allows the same faces and names to transfer from government to mass organizations to military positions. This revolving system has been operating for 36 years. The Party, the State and mass organizations are intertwined. To claim that Cuban mass organizations represent civil society is to deny that the latter has any right to exist as an independent force. This is the kind of participation Nazi and fascist regimes encourage, together with the “personality cult” of the leader. The revolutionary leadership and the leader himself have designed a totalitarian society; changes to the control mechanisms and reforms are attempts to strengthen this grip. There is an effort elsewhere to reduce the influence of the state by changing its orientation to make it focus on essential functions (internal order, international relations, defense and provision of needed infrastructure) and an efficient delivery of services based on citizens preferences. Cuba’s 1992 socialist Constitution runs counter to these objectives. Local government autonomy, a long term claim expressed by people in municipal jurisdictions, is granted in Latin America with very few controls. In the case of Brazil, for example, this autonomy extends to fiscal management. All Latin American constitutions— except for Cuba— currently grant autonomy to municipalities. Further, most former socialist countries have rejected the principle of double subordination, which Cuba maintains. Changes to state organization made by the Cuban leadership recently have been primarily motivated by economic concerns. They have followed a pattern of decentralization where enterprises and state dependencies have been given new responsibilities formerly executed at the central level, but still decisionmaking comes from above. What is being searched in former socialist countries and most countries of Latin America is not decentralization, but the devolution of authority, which includes policies to strengthen autonomous organizations and self-government of subterritorial units. Employment in Cuban state payrolls has been reduced but the scope of reduction appears limited. This situation contrasts with significant efforts made in Latin America regarding decentralization and strengthening of local government. For instance, Colombia has been engaged in state modernization since 1974. A new (1991) Constitution has been approved which makes significant reforms at the central and sub-national level. The central government has reduced its size significantly in Chile and Colombia through reorganizations taking into account sub-territorial layers. Large numbers of former central government workers have been transferred to local governments. The experience of the Soviet Union and former socialist countries indicates that the approach to systemic transitions should be multi-dimensional approach. Structural adjustments and macroeconomic stabilization policies are not enough. They must be accompanied by capacity building of institutional patterns of behavior around the rule of law, private enterprise, globalization, competitiveness, state modernization, municipal strengthening and human resources training, among others, in order to stimulate market forces and rational behavior. Decentralization steps and changes in local government and citizen participation in Cuba seem to be limited to specific sectors such as foreign trade and tourism. They resemble the usual “capitalist” cycles undertaken by former socialist countries in the past. They aim to isolate the political sphere and, therefore, its power structure, from economic openings. Cuba is not following the model of countries undergoing democratic transitions and is instead pursuing that of countries with authoritarian rule seeking economic openings to the rest of the world. It may be useful to examine the extent to which other regimes— for example, Spain during the last years of Franco; China with its four modernization principles; Chile under the military regime after the plebiscite; Taiwan under the influence of Chinese emigrants at the beginning but suffering political changes after the death of Chiang; Singapore with its present regime; Indonesia under Sukarno and Suharto; Korea since the sixties until recent democratic changes at the end of the eighties introduced effective multi-party systems, balance of power and anti-corruption practices— have managed to accept greater political opening than Cuba. China, Viet Nam, Romania, Bulgaria, Albania, Cuba, the Democratic’s Republic of Korea and Laos— where there is still a commitment to socialist ideology and the expectation of a greater role for the state, and post-socialist states such as Poland, Hungary, and the former Czechoslovakia and German Democratic Republic (GDR), which are undergoing drastic political and economic changes toward market behavior and closer relations with Europe and the United States. 21 The former Yugoslavia is a middleof-the-road example where non-socialist parties took control of the Federal Republics of Slovenia and Croatia, while the remaining areas are more attached to former socialist structures. It should be recognized that these are dynamic situations, and changes may be in store that will make some of these judgements seem premature. Within the sample of authoritarian countries, Chile was able to make the transition toward democracy even though military influence still prevails in certain areas. Taiwan and Korea also offer similar transitions after authoritarian periods. Taiwan as well as Chile had regimes with a strong degree of personalism. Spain offers a good comparison as Franco shared many characteristics with Fidel Castro: Galician origin, anti-Americanism, military background, language and cultural heritage, although they had very different ideological approaches. However, there is nothing in Cuba like the Spanish monarchy that could play the role of an intermediary institution. The revolution did not leave any competing organization intact. Perhaps, the Catholic and some Protestant churches, together with powerful foreign countries, could play this role. Recently the hierarchy of the Catholic church has called for change and reconciliation through a national dialogue between the regime and its opponents in Cuba and in the exile community (Aguila 1996). A similar contrast may be made with Augusto Pinochet in Chile, with the difference that Pinochet has preferred to guide his succession while he is still alive and protected by the military. In this sense, Pinochet seems to be at some point between Franco and De Gaulle regarding the concern for the legitimacy of his regime and succession. If Castro does not take steps in the direction of legitimacy of successors, polarization will prevail. So far, Castro has been careless, slow and stubborn regarding alternatives to the present system. The odds at present are against the survival of the Cuban revolutionary heritage in historic terms, that is, beyond the life span of any individual. The top leaders have their mind on pursuing economic reform measures but not their hearts. Their attitudes are contradictory. Human initiative is curtailed if growth entails palpable inequalities, such as those related to dollarization of the economy. State technocrats give autonomy to managers of enterprises but within certain limits. These constraints may lead to artificial results. The zealousness of maintaining everything under state control leads to bargaining negotiations between technocrats and managers because market mechanisms simply are not there. This has been the case in former socialist countries. Changes made at the local level follow a logic that has characterized the Cuban Revolution since its beginning. It reflects a genuine concern regarding the greater participation of young people and a lower level of concern regarding local leadership at all levels of the power structure. The new electoral legislation eases the difficulties of young people in reaching higher positions within governmental structures. Issues tackled by other countries in regarding decentralization and local government seem very far from concerns being addressed by Cuba’s government. Democracy as it is known in most parts of the world is not a goal of the Cuban regime; autonomy of subterritorial units is not a concern; fiscal decentralization is not relevant; NGOs are attacked and legitimacy of their activities is questioned; market-building steps are absent; privatization is out of the agenda except in for some narrow areas; and state organization remains much as it is defined in the 1976 Constitution. being under attack and the drama for the Cuban population, still being asked to make more sacrifices without hope that the future will bring greater rewards may be influencing these outcomes. Openness may be synonymous with betrayal. The revolutionary leadership feels that is entitled to select their opposition among Cuban political forces within and outside the island: their own scholars, their capitalists, and now even their own NGOs. The discourse behind recent changes regarding decentralization, local government and participation also reflects this cautious approach. The trend is toward greater degree of social control instead of less government intervention in the private life of ordinary citizens. Now it is the turn of ordinary citizens. They have been subject to mobilizations and military enlistments; voluntary labor; salary cuts; food rations; “vigilante” activities; and family divisions. Not even sport activities have been free from these manipulations. To follow a path of self-fulfillment in baseball, such as joining a professional U.S. major league team, a rather innocuous action in any country in normal times, becomes a “betrayal” and evidence of “counter-revolutionary” behavior. Pressures has being created from internal as well as external sources. Foreign ’invasions,” “embargoes,” isolation policies, and mere indifference has helped sustain an otherwise critical situation for years without any sight of light at the end of the tunnel. The search for a political structure adjusted to human needs calls for a halt to any kind of pressures. The only sensible measure to put an end to these sufferings, pressures and manipulations is to let the Cuban people express their will. If the people is the sovereign, as Sarmiento once said, let’s educate the sovereign. The Cuban people are entitled to be fully informed so that they can make the best decisions. Information should flow freely to make this possible. Then, a national election, certified by international observers, should take place. It is the only basis to bring about legitimate decentralization, local government and participation at present. However, the attitude of the Cuban revolutionary leadership toward the Nicaraguan elections preclude a positive reaction to this suggestion. The Cuban reality today is very far from these goals. Aguila, Juan M. del. “Development, Revolution, and Decay in Cuba,” in Latin American Politics and Development, Howard J. Wiarda and Harvey F. Kline (eds.). Boulder: Westview Press, 1996. Alonso, José F., Donate-Armada, Ricardo, and Lago, Armando. “A First Approximation to the Design of a Safety Net for Democratic Cuba,” in Cuba in Transition— Volume 4. Washington: ASCE, 1994, pp. 88-154. Amaro, Nelson. Descentralización, Gobierno Local y Participación-América Latina/Honduras. Honduras: Guaymuras, 1994. Amaro, Nelson. Descentralización y Participación Popular en Guatemala. Guatemala: Serviprensa/ INCEP, 1990.
ba, Carmelo Mesa Lago (ed). Pittsburgh: University of Pittsburgh Press, 1970. Balázs, Istvan and Bertók, Janos. “Modernization of the Hungarian Public Administration,” in Decentralization and Administrative Modernization in Central and East European Countries, Report of a Workshop held in Maastricht, The Netherlands, 30 November-30 December 1993, Governance and Public Administration Branch, Unit ed Nations. New York: United Nations, 1995. Blanco, Juan Antonio. Cuba: ¿“Museo Socialista” o Laboratorio Social? (Carta a un amigo europeo). Manuscript (circa 1996). Boisier, Sergio. Ensayos sobre Descentralización y Desarrollo Regional. Santiago de Chile: Cuadernos de ILPES, 32, 1987. Brandwayn, Susan. “Cuba’s Economic and Management Policy Response to the Changing Global Environment,” Public Administration and Development 13 (1993), pp. 361-75. Castro, Fidel. “Esta ley perfeccionará nuestro sistema y todo el poder popular,” Gramma (30 October 1992). Castro, Fidel. “Estas elecciones han enseñado más a nuestro pueblo que millones de conferencias sobre democracia,”Granma (23 February 1993), 2-7. Castro, Raúl. “Informe del Buró Político,” Granma (27 March 1996). Castro, Raúl. “Maintaining Revolutionary Purity,” in Cuba: Political Pilgrims and Cultural Wars. Washington: The Free Cuba Center of Freedom House, 1996. Constitución de la República de Cuba. La Habana: Editora Política, 1992. Decentralization and Administrative Modernization in Central and East European Countries, Report of a Workshop held in Maastricht, The Netherlands, 30 November-30 December 1993, Governance and Public Administration Branch, United Nations. New York: United Nations, 1995. Dilla, Haroldo, González, Gerardo and Vicentelli, Ana Teresa. “Participación y Desarrollo en los Municipios Cubanos,” in Cuba en Crisis: Perspectivas Económicas y Políticas, Jorge Rodríguez Beruff (ed.). San Juan, Puerto Rico: Editorial de la Universidad de Puerto Rico, 1995. Dilla, Haroldo. “Socialismo, Empresas y Participación Obrera,” in Cuba en Crisis: Perspectivas Económicas y Políticas, Jorge Rodríguez Beruff (ed.). San Juan, Puerto Rico: Editorial de la Universidad de Puerto Rico, 1995. Domínguez, Jorge. “Cuba un Nuevo Camino,” in Cuba en Crisis: Perspectivas Económicas y Políticas, Jorge Rodríguez Beruff (ed.). San Juan, Puerto Rico: Editorial de la Universidad de Puerto Rico, 1995. 23-44. Donate-Armada, Maida. “Sociedad Civil, Control Social y Estructura del Poder en Cuba,” in this volume. Harnecker, Marta. Cuba: Dictadura o Democracia. 8a. ed. corregida y aumentada. México: Siglo XXI Editores, 1979. Halebsky, Sandor and Kirk, John M. (eds.) Cuba: Twenty-Five Years of Revolution, 1958-1984. New York: Praeger, 1985. Kaminski, Bartlomiej. “The Failure of the Transition from Direct to Indirect Controls in Poland in the 1980s,” in The Role of the Public Sector in Promoting the Economic Development of Developing Countries, Proceedings of a United Nations Interregional Seminar held in Nairobi, Kenya. New York: United Nations, 1994, pp. 148-171. Malaparte, Curzio. Coup d’etat, the Technique of Revoution. New York: E.P.Dutton, 1932. Marcou, Gerard. “Decentralization in France: Constitutional and Legal Aspects,” in Decentralization and Administrative Modernization in Central and East European Countries, Report of a Workshop held in Maastricht, The Netherlands, 30 November-30 December 1993, Governance and Public Administration Branch, United Nations. New York: United Nations, 1995. Pérez-López, Jorge. Odd Couples: Joint Ventures between Foreign Capitalists and Cuban Socialists. North-South Agenda Papers 16. Coral Gables, North-South Center, University of Miami, November 1995. Pérez-Stable, Marifeli. “La Cuba que Aún Puede Ser,” in Cuba en Crisis: Perspectivas Económicas y Políticas, Jorge Rodríguez Beruff (ed.) San Juan, Puerto Rico: Editorial de la Universidad de Puerto Rico, 1995. Pumar, Enrique S. “Labor Effects of Adjustment Policies in Cuba,” in this volume. Reilly, Charles (ed.) Políticas Urbanas: Las ONG y los Gobiernos Municipales en la Democratización Latinoamericana. Arlington, Va.: Fundación Interamericana, 1994. República de Chile, Ministerio del Interior, Subsecretaría de Desarrollo Regional y Administrativo. Manual de Gestión Municipal. Santiago de Chile: Talleres de LOM, 1993. Ritter, Archibald. “The Organs of People’s Power and the Communistg Party: The Patterns of Cuban Democracy,” in, Cuba: Twenty-Five Years of Revolution, 1959-1984, Sandor Halebsky and John M. Kirk (eds.). New York: Praeger, 1985. Rodríguez Beruff, Jorge (ed.) Cuba en Crisis: Perspectivas Económicas y Políticas. San Juan, Puerto Rico: Editorial de la Universidad de Puerto Rico, 1995. Rondinelli, Dennis A. “Capacity-Building in Emerging Market Economies: The Second Wave of Reform,” Business & The Contemporary World 3 (1994), pp. 153-167. Charles Reilly (ed.). Arlington, Va.: Fundación Interamericana, 1994, pp. 191-210. Support and Management Services, The Role of the Public Sector in Promoting the Economic Development of Developing Countries, Proceedings of a United Nations Interregional Seminar held in Nairobi, Kenya. New York:United Nations, 1994. Solnick, Steven L. “The Breakdown of Hierarchies in the Soviet Union and China: A Neoinstitutional Perspective,” World Politics 48 (January 1996), 209-238. Stepien, Jerzy, Gintowt-Jankowicz, María, Rabska, Teresa and Ruszkowski, Jacek. “Local Government in Poland and Problems of Decentralization,” in Decentralization and Administrative Modernization in Central and East European Countries, Report of a Workshop held in Maastricht, The Netherlands, 30 November-30 December 1993, Governance and Public Administration Branch, United Nations. New York: United Nations, 1995. United Nations. The Role of the Public Sector in Promoting the Economic Development of Developing Countries, Proceedings of a United Nations Interregional Seminar held in Nairobi, Kenya. New York: United Nations, 1994. United States Information Service, Voice of America, Offfice of Research & Policy, Radio Martí Program. Cuba Annual Report, 1987. New Brunswick: Transaction Publishers, 1988. Werlau, María C. “Foreign Investment in Cuba: the Limits of ‘Commercial Engagement’ as a Policy Prescription,” in this volume. Wiarda, Howard J., Kline, Harvey F.(eds.) Latin American Politics and Development. Boulder: Westview Press, 1996.